Bernardo Lliteras is passionate about bees. No one doubts he knows more than anyone else on the island about every aspect of apiculture. 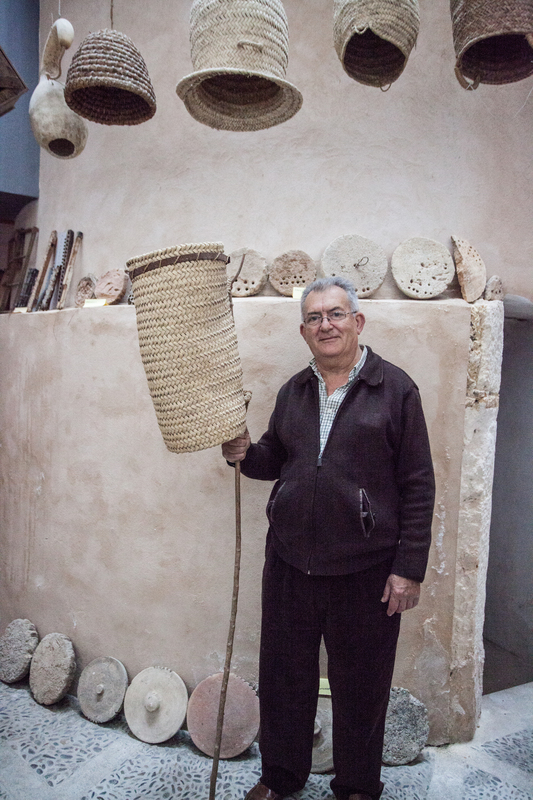 He has a library of over 300 books on the subject, hives full of honey and has collected so many historic objects from the art of bee-keeping around the world that several years ago Llubi town council gave him an old flour mill in which to create the island’s sole bee museum. You can visit the Bee museum in Llubi, the personal tour is free, although due to the size of the place there is a maximum number of people allowed to visit at one time. Whatever the day of the week or the month of the year, whenever someone calls Bernat and asks about the museum, he travels from Palma and gives them the full guided tour for free. You can ask him about each and any of the pieces: each has a story, a small fragment of a jigsaw, but all this could be about to be thrown away. But it’s not sure for how much longer this will be possible as Bernat has to move his collection to a new location, destination currently unknown. And with no budget for the museum it’s doubtful that the collection can remain intact. The town council have decided it wants the building back to try and make some money from it. The electricity supply has already been cut off. When I go to visit him at the museum I am met by him and his children. It’s obviously a family affair and although Bernat is clearly the most passionate about his collection and his bees, all of his grown up kids support him and are full of knowledge as well. 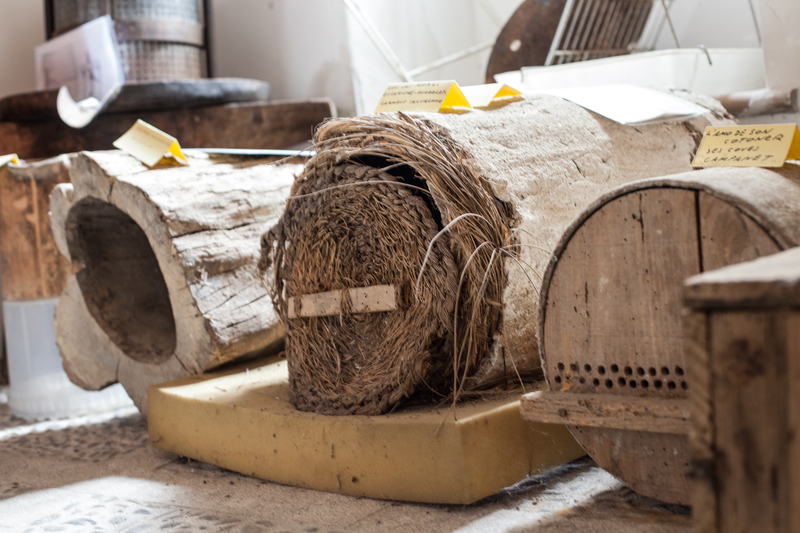 There are around 200 objects through which you can see the development of beekeeping through the centuries including hives, extractors, masks, and more. It’s the result of more than thirty years of patient collecting: Bernat’s grandfather used bees to pollinate the family’s land but he passed away before he could teach Bernat, so Bernat taught himself through books. 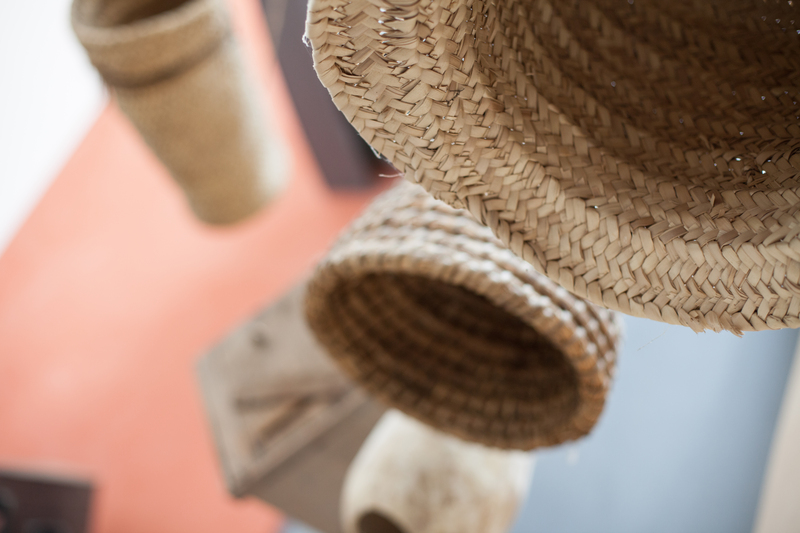 As he delved into the intricate lives of bees and the rich history of beekeeping Bernat started to discover curious objects and so his collection began. Soon not only was he finding objects in farms across the island but he was being given them. Now he possesses objects which originate from Majorca and all over Europe and even Africa. Bernat’s collection of beekeeping equipment and paraphernalia not only stretches across continents it also goes far back in time to the mid-1600s when beeswax was more valuable than honey as it was used to make candles from: there was even a law which punished you if you adulterated the wax with animal fats. And so the bee museum was born partly out of necessity to have somewhere to store all these artefacts, and also to have the opportunity to communicate the vast knowledge that Bernat has to interested people. But why bother with bees? These days most of us know how important they are to the equilibrium of our planet’s ecosystem, and how endangered they are. Bees help to pollinate 75% of the world’s food crops, while honey, propolis, pollen and venom have extensive medicinal uses. Since the early 1990s billions of bees have been dying across the globe in a phenomena known as Colony Collapse Disorder (CCD). In September 2013 37 million bees were wiped out on a single Canadian farm. There are no wild bees left in Britain and the rest of Europe is also feeling the effects of CCD, which scientists believe to be caused through complex chain reactions between pesticides, fungicides and modern monoculture farming methods. The situation has become so acute that there is an international drive to help and encourage hobby bee-keepers in towns and countryside alike. Today city rooftops are buzzing. There are hives on top of the Paris Opera House, London’s exclusive Fortnum & Mason’s store, and many of the emblematic buildings of New York. Increasing numbers of “stingless” bees are being bred to help urban beekeepers to thrive. Although the bees have suffered horribly over the past 15 years, in much of Europe this is an exciting and dynamic time for budding bee enthusiasts. Even in the centre of Palma I have heard about hives of bees. Up in Llubi the situation drags on, uncertainly. Bernat continues to painstakingly research the background of each object he has to establish exactly what the piece was used for and then display this information via photocopied sheets from bee keeping books with handwritten notes. But he needs somewhere permanent to house his collection, somewhere accessible, ideally he says he would like it to be in Palma as that is where he lives. 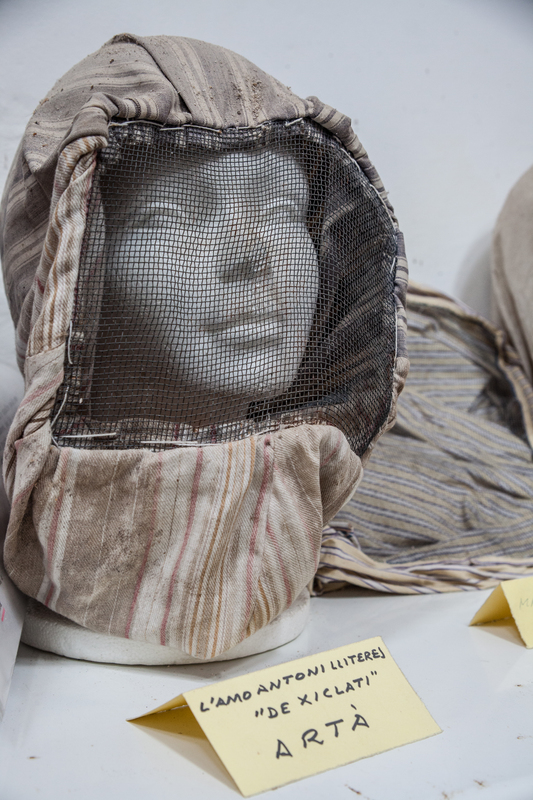 Details of the great bee colonies of Calvia, hives used by African Masai warriors, reproductions of protective clothing from the 16th century, and endless curiosities from around the world may end up in a skip within a couple of months. “I have nowhere to keep them,” Bernat said sadly. “It’s 35 years of work, but it needs an area where things can be labelled properly, with interactive zones that can bring the stories alive.” For many Europeans a bee museum could become a fascinating stop on their winter tourism agenda, but with every passing day its survival looks less likely. I ask him what we can do to help, I think he probably needs an angel but Bernat says “Anyone can help, with their heart they can help”. At the entrance of the museum there is a small statue of Saint Ambrolio, patron saint of apiculture. Both the bees and Bernat could use a little of his divine intervention right now. Bernat teaches beekeeping and runs short courses. You can find the Bee Museum at “Museo de Apicultura de Llubí”. You can contact Bernat by email on meldeflors@hotmail.com or telephone 686 230 703. 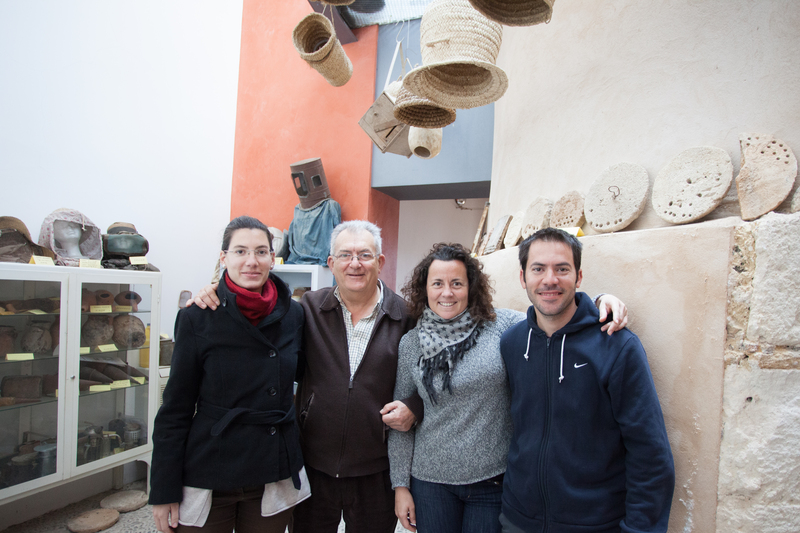 The kick off of the Dragonera Piragua (2013). Our lovely neighbours, Nick and Diane Morgan invited my daughter and I to go out on their boat and follow the race: everyone had a great day out. 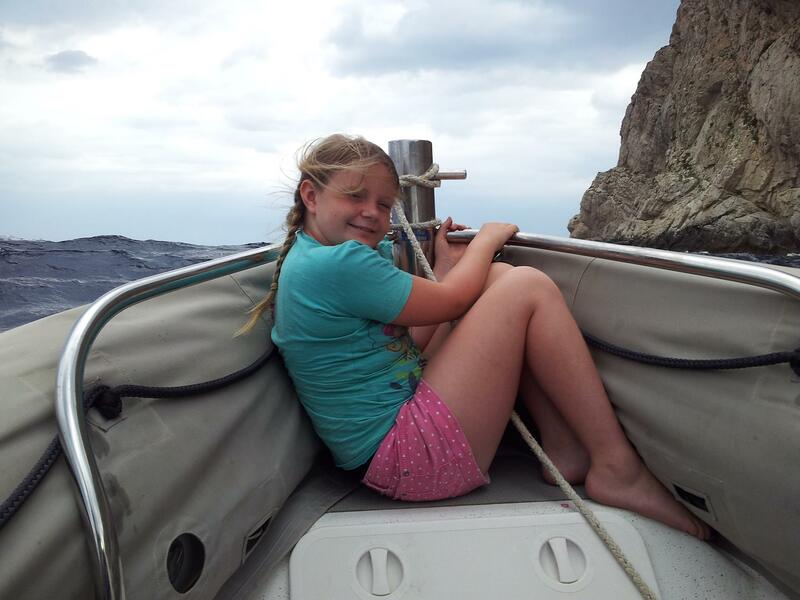 Ever since then we have managed to repeat this: Oliver goes on a begged/borrowed/stolen canoe, and we follow and have some fun bobbing around on the sea, in the sun, having a little picnic and enjoying the riches that the Mediterranean offers. This year, we thought, was to be no different. 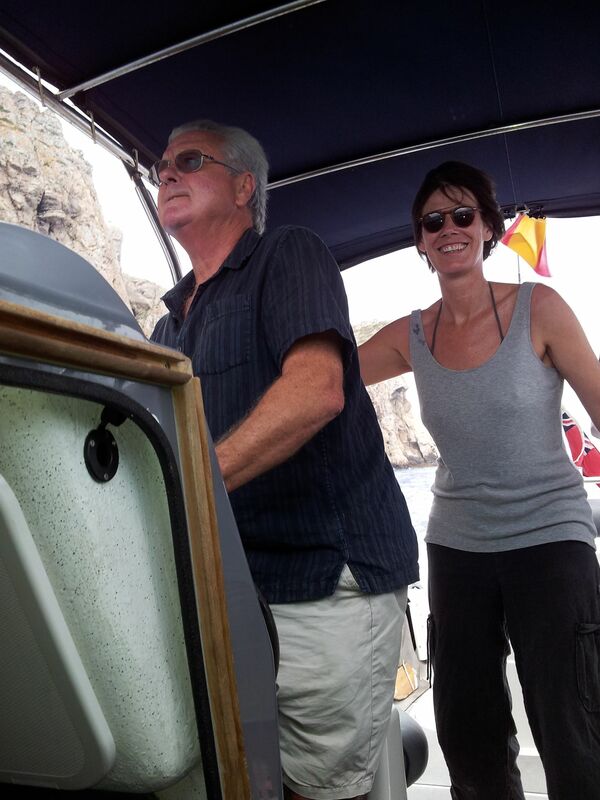 Setting out for a fun day on the boat with Nick and Ulrike. The weather forecast for Sunday was that there might be some rain and lightning at some point but that this didn’t seem to put off the majority of the people who wanted to circumnavigate the island of Dragonera, indeed 742 people registered to participate and set off on Sunday morning at 9am. Over in the Port of Andratx we gathered for our jolly morning out and cast off “Flying Fish” an 8.5 metre Protector rib at 9.30am. Funnily enough I remember commenting that I had brought an extra t-shirt with me as I thought it might be a bit chilly out there, even though the sun at this point was blazing down on us. We were in good hands with skipper Nick Morgan who (aside from being a great neighbour) is also a very experienced sailor with over fifty years at sea racing sailing boats in various classes from dinghy up to over 50 feet and holding National, European and World champion titles. Nick describes his boat as the equivalent of a four wheel drive, it can go anywhere and do anything. It’s a versatile craft and is sometimes used as a camera boat for the Super Yacht Cup amongst other regattas. Little did we know that Nick’s boat was going to have to live up to its original purpose, as a rough sea rescue boat. Coming along for the ride was Sandy and John, (both retired teachers), Ulrike (who works in Port Andratx in a doctor’s surgery), her partner, Tim (a builder) myself (an unfit desk jockey but trying to exercise a lot more regularly these days) and my little girl who is eight and probably fitter than the rest of us put together. Setting out for a fun day on the boat, you can see the swell rising in front of the bow. This was taken minutes before our first rescue. It was at about this time that Oliver says that the kayaks, which had been moving towards the northernmost point of Dragonera, were told by the Guardia Civil Coastal (the coastguard to you and I) to turn and go into the small harbour at Dragonera. 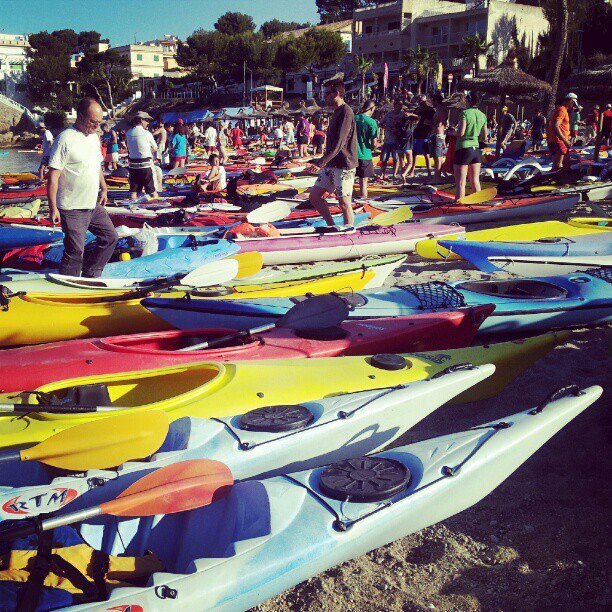 Already many of the people on the kayaks had taken tumbles into the roughening sea and were being rescued by small dinghies which were being deployed by the organisers. 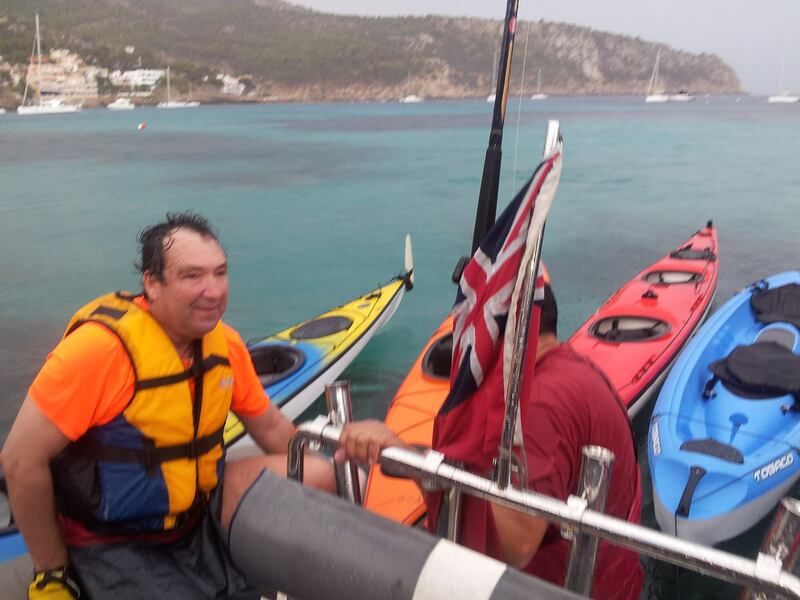 The coastguard was there to make sure that no kayaks were going around the back of Dragonera into the open black water as it had been deemed to be too dangerous due to the weather turning and the currents. However, there was one big flaw in their plan, and unwittingly the crew of the Flying Fish were about to become local heroes. 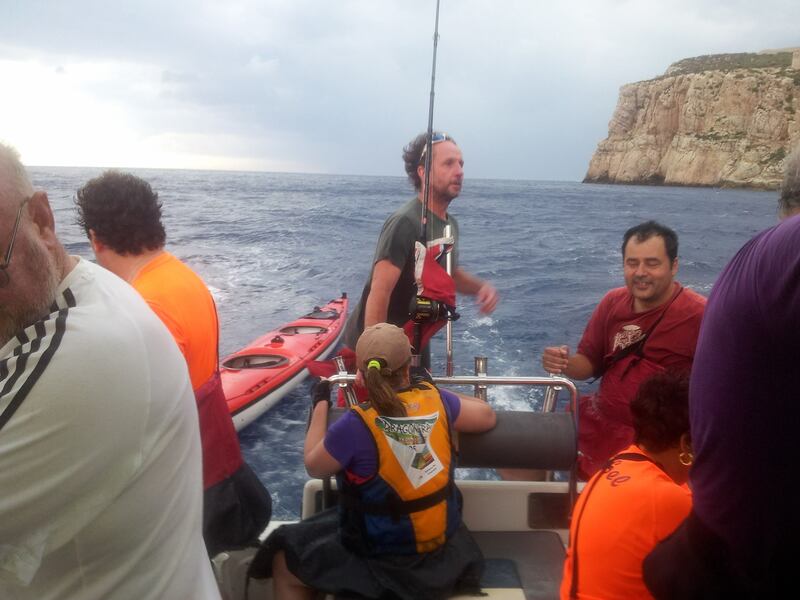 We didn’t realise that the race had been called off and as we approached the southernmost point of Dragonera (the other end to where the kayakers had been told to turn back) we saw the waves were beginning to swell. 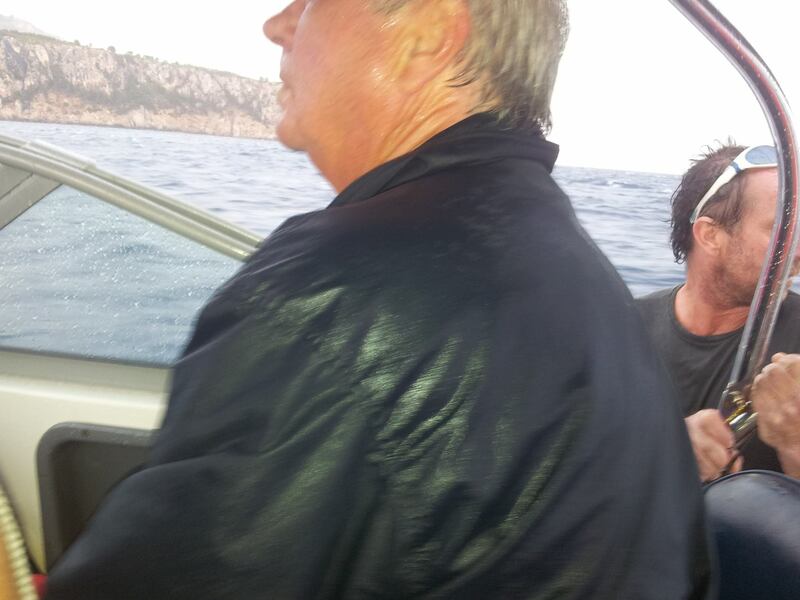 First two passengers, soaking wet and very happy to be onboard, at this point none of us realised how bad it was going to get. We found kayakers struggling, (in retrospect I can’t explain why these people would have been there if the Guardia had been successful in turning everyone around) and we were soon being waved at to come to the aid of an older couple who were both in the water hanging on to their boat. The woman had on a buoyancy aid but had swallowed a lot of salt water and it was her that we dragged onto the Flying Fish first. “Como te llama?” I asked the lady, as I wrapped my beach towel around her, “Isobel, gracias, gracias a ti!” she replied. Isobel, I think, was Spanish and her companion, German. I could see the big Guardia Civil boat looming up behind them; it must have gone around the back of the island to check there was no one in trouble. The ramshackle crew of Flying Fish all felt quite pleased with themselves I think: we had helped out a couple of people in need, this was going to be a good story to tell down the pub and so we turned towards Sant Elm beach to get them back to dry land. “I wonder what you’ll be writing about this week,” joked John, and I thought to myself, yes Vicki take some photos. So I dug out my camera and took a couple of shots, wondering where on earth my husband was and hoping that he was okay. The weather beginning to turn. 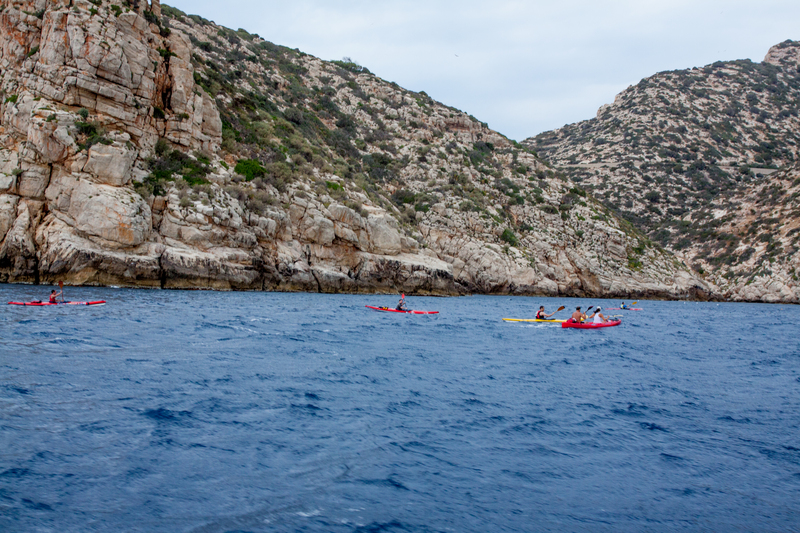 As we rounded the point of Dragonera to head in towards Sant Elm we started to see more kayaks that were in distress. 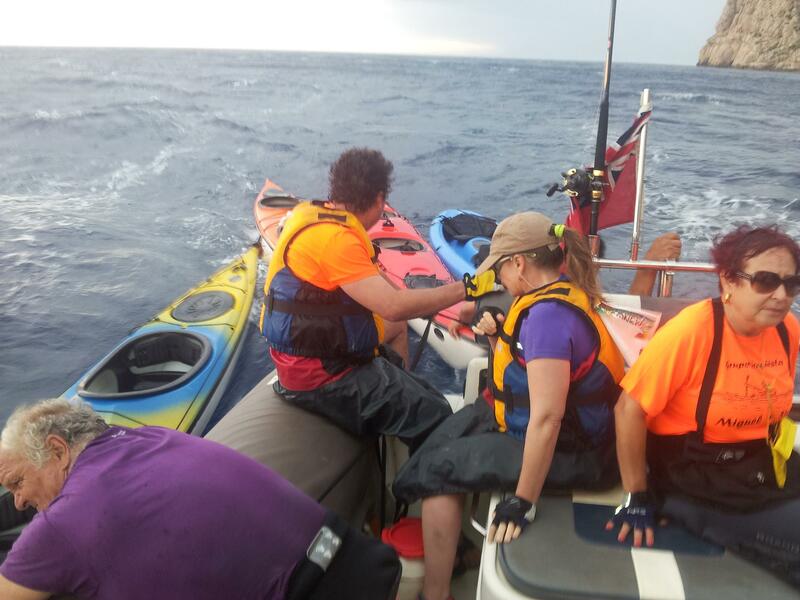 Within five minutes we had another couple on board and another kayak tied to the stern of the Protector which had begun to live up to its name. 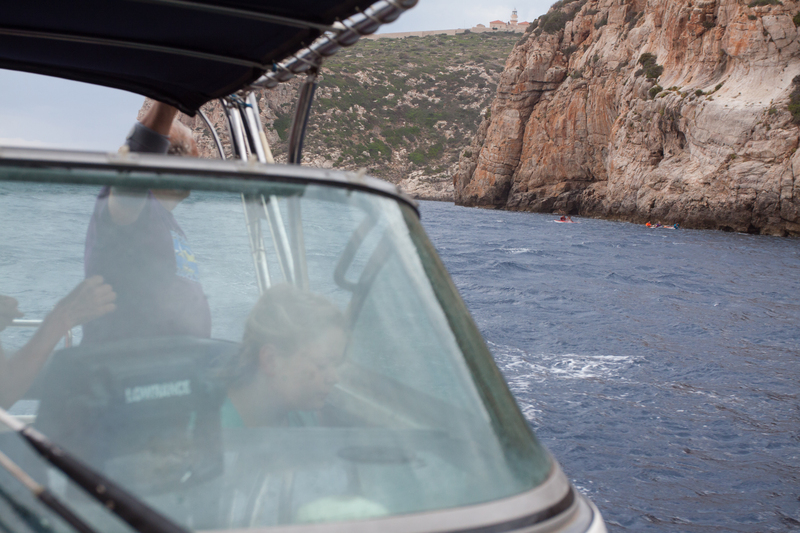 We turned to look behind us and saw the big Guardia Civil Coastal boat steaming off in the direction of Palma, it hadn’t followed us down the Easterly side of Dragonera and it didn’t get close enough to any of the kayakers to see if they needed help. This was to be the last we saw of any rescue boats or the race organisers’ boats for about an hour. It was when we found a dad and two kids being blown against the rocky side of island that I think we all began to think this was getting a lot more serious. We got the kids and put them inside in the little cabin where they sobbed with fright and Gigi and Sandy took care of them. The kids (left) with Gigi (right) trying to keep them calm. As the weather worsened and we chugged slowly down the side of island dragging three kayaks behind us we found more and more people who were exhausted from paddling, who were in the water and couldn’t get back on to their recreational crafts or who were absolutely terrified and unable to move. 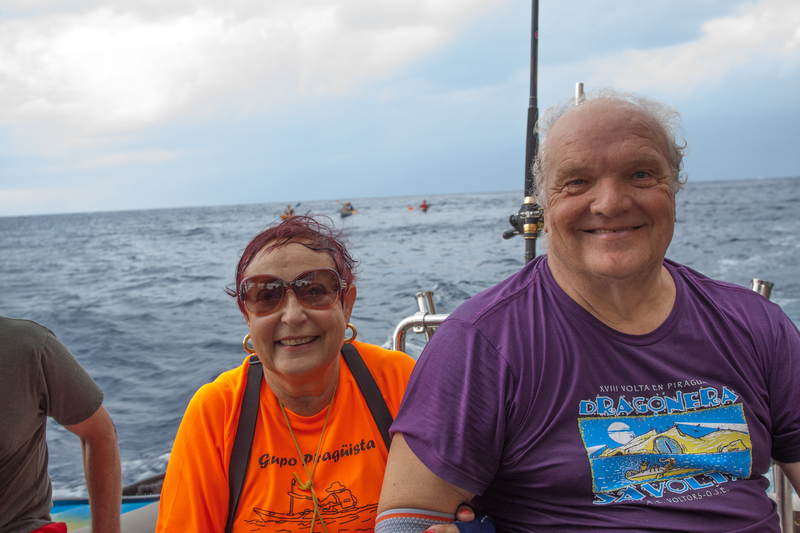 As the waves got bigger and the wind speed and strength increased, as the rain and lightning started and the visibility decreased dramatically it became very clear to us neighbours on board for our fun day out that we were going to have to pull together to help as many people as possible. It’s about now that the lightning started. We pulled person after person out of the water. Occasionally we would find a kayaker who was okay and able to continue but mostly we encountered people who needed help. I kept asking their names, but as soon as I had asked them and introduced myself and the rest of the makeshift rescue team I forgot them. Soon the kayakers were sitting in the well of the rib or on the inflated tubes on either side holding hands and comforting each other. 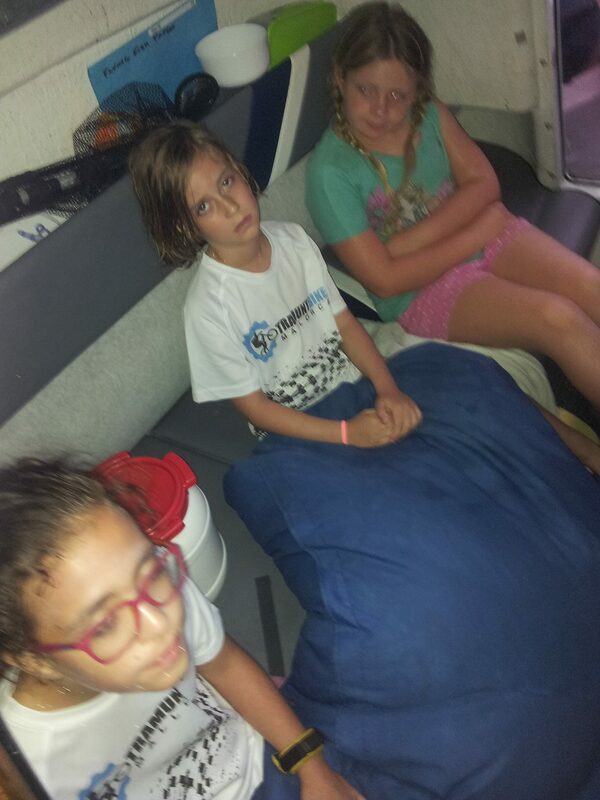 This feeling of relief brought with it some moments of black humour about catching the Sant Elm Autobus and we joked about welcoming “Clientes Nuevos” on board, but the jollity didn’t last long as the weather continued to deteriorate and some of our passengers started to get seasick. More people happy to have been rescued. 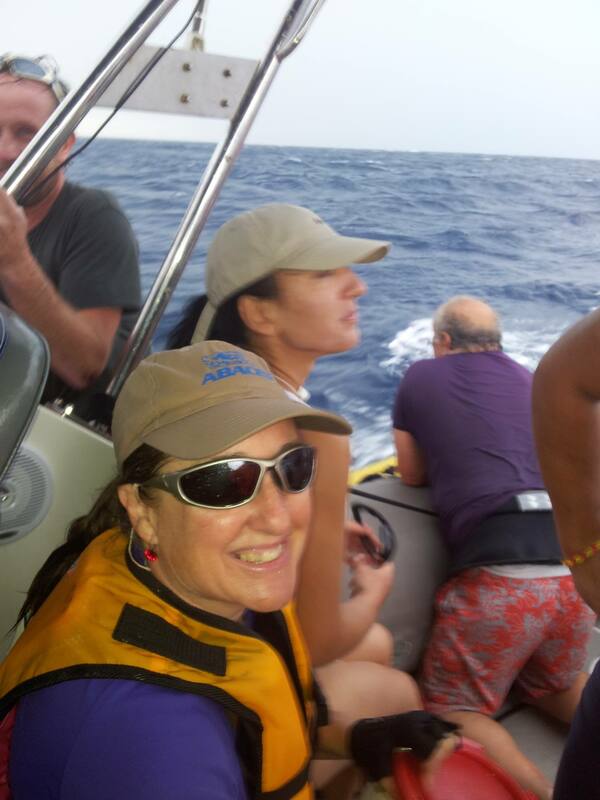 I pulled a Spanish woman out of the sea who was floating in the water holding on to the paddle of her kayak. We needed her to swim a little towards us but she just didn’t seem to be able to manage it. I locked eyes with her and reached and reached for the paddle, as did Tim. We both got hold of it and she let go of it as if she was trying to hand the paddle to us. The shock, confusion and tiredness in her eyes was enough for me to get ready to jump into the water and grab her myself but the rib just bobbed close enough to her again and we managed to get hold of her and pull her by her shoulders into the boat. She sagged there, suspended between the tube and the seat unable to lift herself up so I did, I asked her name, gave her a hug and sat her down. More customers for the new Sant Elm autobus! I did a head count, we now had a dozen people on board and their kayaks or canoes (I’ve never been completely clear of the difference to be honest) attached to various parts of the Flying Fish. It all started to look a bit like we were re-enacting D-Day. John found himself sitting on the bow talking with a Frenchman who was very upset about the lack of help from the official organisers. Looking around us none of us could understand why we had not seen any other boats out scouting for people who needed help. How could they have missed these people, a dozen and counting, that we had pulled out of the sea? I tried to take some more photos but the camera on my phone crashed and refused to work, somehow it seemed more important anyway to keep looking for more people who may need help. Ulrike, Nick and I tried to keep spotting heads and paddles fighting through waves, or a flash of colour in the driving rain. We were all soaked through. I almost shouted out then realised what I was spotting was the wings of a seagull flying low over the steely grey water. Then we pulled another couple of fit looking young men out of the waves, they were exhausted as well and could not continue and my thoughts turned again to my husband. If these twenty-something guys were unable to paddle through the storm, would Oliver be able to get back to shore. Soaking wet, still scouting for more kayakers in trouble. Tim is holding on to the outside of the boat because by now it is very full. Eventually we managed to reach the quay in Sant Elm. We were not met by anyone with space blankets or given any sort of help, although there were a couple of Guardia officers there who helped people to get off of the rib and onto the quay. On the beach apparently more people were being treated for hypothermia. If you read today’s press release the organisers think everything to do with the rescue operation went “perfectly”, well I disagree. Not wishing to sound dramatic but I truly believe that if we had not been there and done what we did that some of the people who we landed safely back on dry land would not have survived. No other boats (official or otherwise) came down the easterly side of Dragonera beside us and in my opinion that was their big mistake. In addition I was disgusted to hear today that a boat which runs from Dragonera back to Sant Elm refused to give passage to the people whose kayaks had been lost, insisting they had to pay or they were not allowed to board. Once we had got our cargo safely to shore my thoughts turned properly to my husband and after a barrage of phone calls he finally answered, “Hi ya! I’ve had an adventure!” “Wait until you hear about mine”, was my reply. 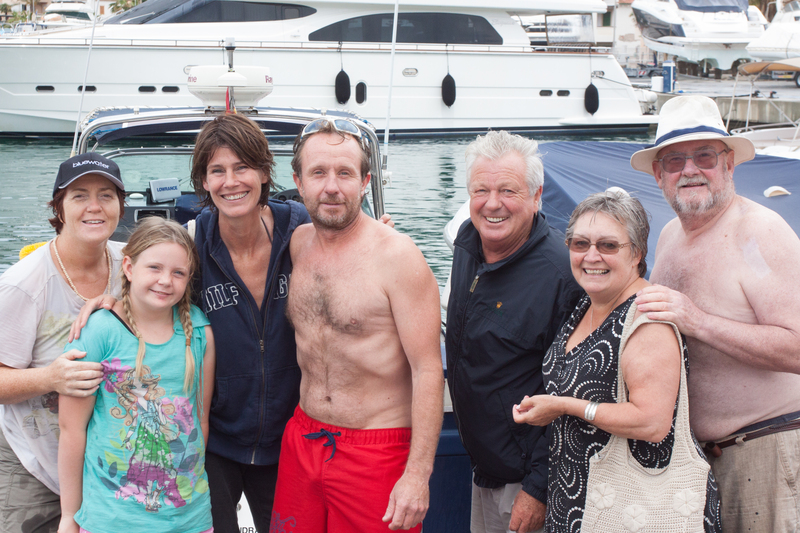 The crew of Flying Fish, and now local heroes, (from left) Vicki, Gigi, Ulrike, Tim, Nick, Sandy and John. We rescued 16 people, 14 adults and 2 children on the morning of Sunday June 15th. It’s a testament to the skill, determination, teamwork and courage of a group of normal people that we were able to do what we did. Now we really have a good story to tell down the pub. 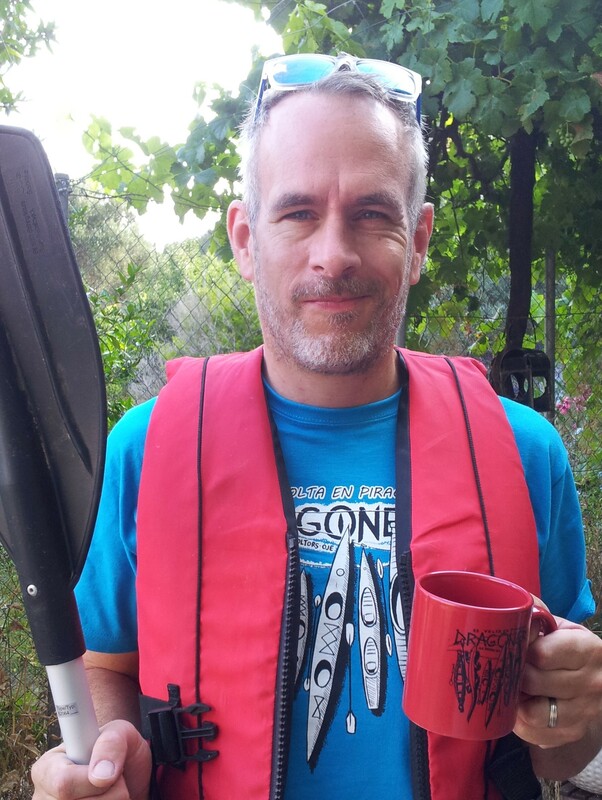 Ollie, safe and sound with his souvenir t shirt and mug.